China will invest nearly $20bn (£11bn) in Argentina over the next 10 years. 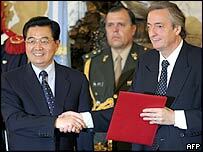 The announcement of the trade and investment deals came on the first day of a state visit to Argentina by China's President Hu Jintao. The visit is part of Mr Hu's two-week Latin America tour to expand China's economic presence in the region and comes after his state visit to Brazil. 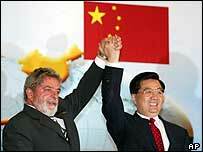 In recent days, Mr Hu had said that China planned to invest $100bn (£55bn) in Latin America over the next decade. The announcement of the multi-billion dollar agreements came after Mr Hu was received by Argentina's President Nestor Kirchner in the presidential palace in Buenos Aires on the first day of his two-day visit. After a private meeting that lasted about an hour, the two presidents emerged to sign a number of accords. These covered investment in Argentine railways, and also agreements on education, tourism and trade. Three years after Argentina's devastating economic crisis, the promise of Chinese investment could not have come at a better time, says the BBC's Elliott Gotkine in Buenos Aires. Mr Hu's arrival in Argentina followed a five-day state visit to Brazil. During the visit, Brazil met Chinese wishes to recognise it as a market economy. In return, Brazil was granted greater access to China's market for chicken and beef products. The beef deal alone is expected to be worth $600m (£324m) a year for Brazil, ministers said. It also gained a commitment from China to order at least 10 aeroplanes from Brazilian maker Embraer, reported the AFP news agency. To facilitate trade, the Chinese are offering between $5bn (£3bn) and $7bn (£4bn) worth of investment to improve Brazil's roads, railways and ports. China sees the deal as an important step towards obtaining better trade terms from the World Trade Organisation. On Thursday, Mr Hu goes on to Chile for the annual summit of the Asia-Pacific Economic Co-operation (Apec) forum in Santiago. Later, he is due to travel on to Cuba.